Are you planning on traveling with a dog this holiday season? Here are some vital tips to keep your dog and your vehicle safe on the road this season. Go to the vet before you leave. Make sure your dog has a clean bill of health before you begin your trip. Make sure your dog is wearing tags that have your contact information. Bring the comforts of home with you. Bring your dog’s food, water, treats, bowl, bedding and anything else your dog needs on the trip. A sudden change in water source or food can give your dog diarrhea, which is a mess you want to avoid on any trip. This isn’t the 1980’s anymore. Make sure your dog is properly secured when traveling in your vehicle. Either secure the carrier to your vehicle, or use a special restraining harness that can be attached to the seatbelt in the back seat. Dogs can get car sick, too. Make sure to do a light meal before traveling and make sure your dog has water. Take plenty of breaks, even more than you would normally take on a trip without a dog. Give your dog plenty of time to stretch its legs, get some exercise, and use the bathroom. 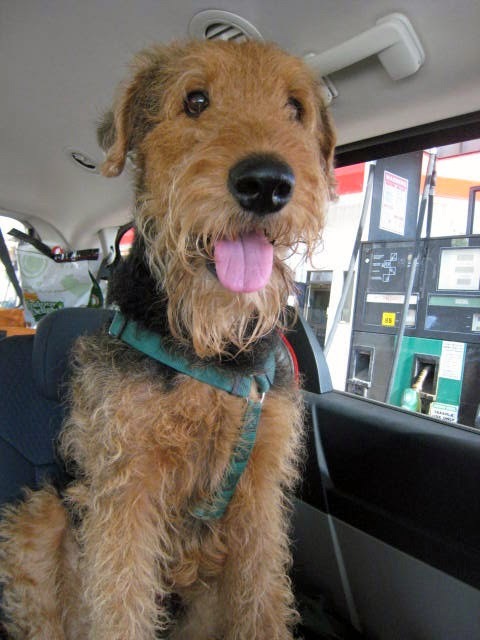 Make sure to keep any automotive fluids (e.g., antifreeze) separated from where you keep your dog in the vehicle. These fluids are poisonous and often lethal if ingested. Take your time on the road this holiday season and stay safe. Jiffy Lube of Indiana also has the health of your vehicle covered this season. Just bring your vehicle in for a Jiffy Lube Signature Service Oil Change, and our certified technicians will give your vehicle the preventative maintenance it needs to stay on the road.